Founded back in 2007 by former PayPal, eBay, Luminex and Tesla Motors execs, MaxPoint Interactive this morning announced that it has secured its very first institutional round of $3 million in funding from Trinity Ventures. By combining multiple data sets to form what it refers to as “Customized Consumer Profiles”, MaxPoint says it is able to identify the best potential customer for any brand – those that are both interested and capable of purchasing the product. 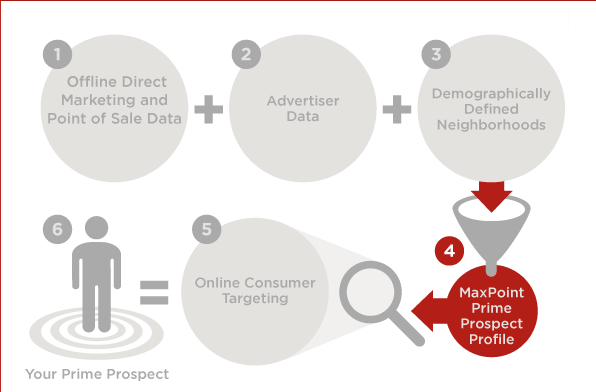 MaxPoint Interactive says its Digital Zips segment the country into 34,000 distinct neighborhoods, each with approximately 3,400 households, allowing marketers to pinpoint locations within a retailer’s trade area and to more precisely serve up their targeted online ads. “This means that national brands and retailers are wasting a large portion of their online advertising budgets, as these impressions are not driving in-store sales. It’s most certainly an intriguing approach, although a lot of what MaxPoint touts is possible with its technology relies heavily on the tastiness of its very secret sauce. Graphs depicting how something works are all fine and dandy, but I’d love to get some reference customers speak up on how well MaxPoint’s innovative targeting technology lives up to all its lofty promises.